Winethropology: An Overdelivering Bargain, Mispriced At $6.99? An Overdelivering Bargain, Mispriced At $6.99? Last night, in search of something to go with heavily peppered goat cheese burgers, I stood in front of the small selection of Australian Shirazzy wines at the local Giant Eagle grocery store. There is no depth or breadth to this selection, but the basics are all represented: Penfolds, Lindemans, Yellow Tail (of course), and Jacob's Creek. As do most producers, this last one has a reserve line. However, the jump from the common label to the reserve line is not subtle. 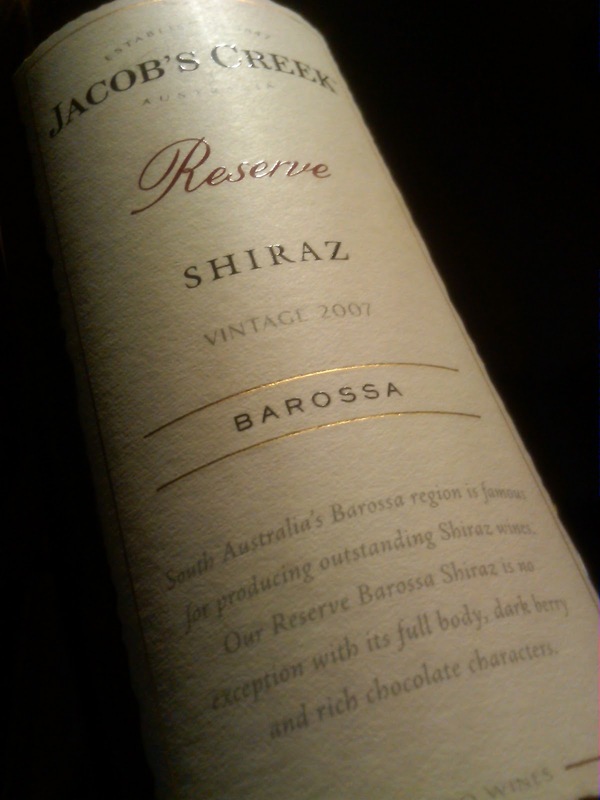 So, I grabbed a bottle of the 2007 Jacob's Creek Shiraz Barossa Reserve. After I got over the shock of the $6.99 price tag, that is. Normally this is a $12.99 wine - and worth that price all day long. But at $6.99? Sheeat, that's buy-by-the-case prices. Let's be clear, this is no complex powerhouse Torbreck competitor, but it is a reliable, very enjoyable wine made well and consistent with the Barossa Shiraz profile. And whether this price is intentional or a clerk's error, the timing couldn't be better. Funny, I just bought a bottle of this and had the exact same reaction. It's cheaper than Fuji water...oh yeah!